Pensacola Beach Florida, known as the “World’s Whitest Beach”, is located on Santa Rosa, a barrier island, and is surrounded by miles of aqua water. With a population less than 3,000 people, Pensacola Beach remains one of the most untouched and best-preserved beaches in Florida. While the kids build sand castlesand play in the clear, clean Gulf water, you can laze on beautiful Pensacola Beach and watch them create memories that will last a lifetime. The Blue Angels, the incredible precision flying aces are home at the nearby Pensacola Naval Air Station. Lucky beach goers often hear a noise, look to the sky and see them practicing their breathtaking maneuvers. The seaport city of Pensacola is rich in Spanish culture and lavish in history as seen in both the downtown buildings and antebellum homes. The ‘look-no-further’ perfect, peaceful escape for any beach lover. One of the oldest settlements in the US, Pensacola has beautifully preserved its’ environment to be enjoyed for generations to come. Enjoy a dolphin seeking tour aboard a Chase-N-Fins boat or enjoy a kayaking, canoeing or snorkeling trip. Pensacola Beach is well known for great shopping opportunities of all kinds. Spend some time exploring one of the quaint beach shops and see who in your group can find the best bargains, as there are many to be had. While you’re in the area, check out the National Museum of Naval Aviation located at the US Naval Air Station. This is one of the largest air and space museums in the world and you will be blown away by the size of these historical naval aircraft. Your kids can write a term paper on the space exploration information and displays. Kids of Most Ages: Visit Pensacola Zoo for a day of family fun. Home to many rare and endangered species, the zoo and grounds are beautiful and include some incredible botanical gardens. Eating: Enjoy a tasty seafood dish (or American, if you prefer) at The Grand Marlin or enjoy a delicious lunch while enjoying the beautiful beach scenery at Lilo’s Tuscan Grille. Sleeping: Stick with a reliable hotel chain and stay in comfort right on the beach at Holiday Inn Express Pensacola Beach. For a very inexpensive stay at a great location and incredible views, Comfort Inn Pensacola is another great option. 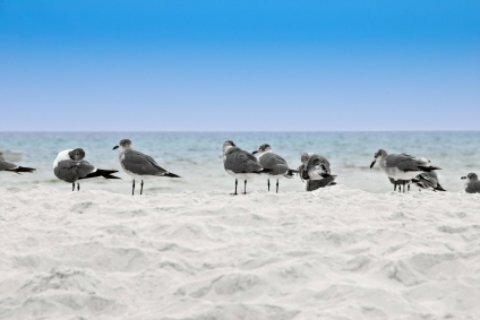 Gather your sunscreen, sunglasses, a good book and head on down to Pensacola Beach Florida! You will be glad you did!